Alex Phatudi Corobrik Building Training Co-ordinator on site at Thembelihle Village assists Eric Mambane with the techniques of building a brick wall. Corobrik’s Montana Light Travertine face bricks were selected for the construction of this social housing development, situated at the intersection of Johannes Ramokhoase and Sophie de Bruyn Streets. 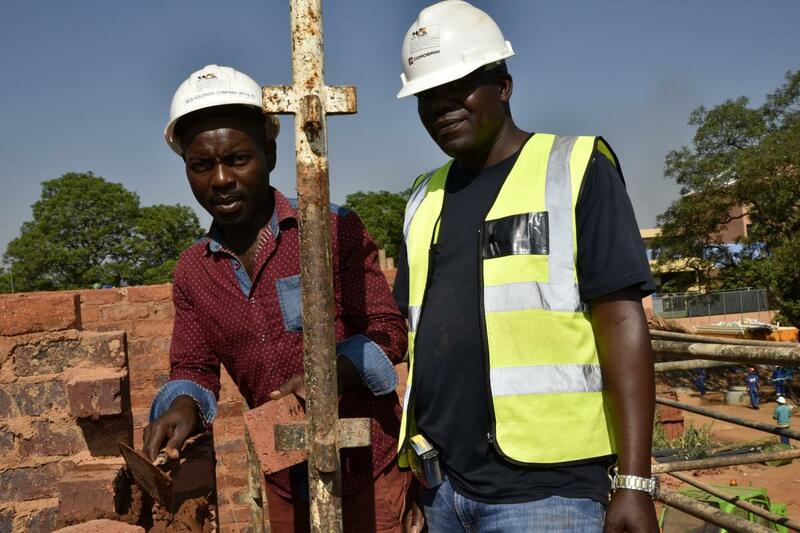 In addition, one of Corobrik’s experienced training co-ordinators provided invaluable bricklaying training on site, ensuring a high standard of work and increasing job potential for participants later on. “The first phase of this social housing project will be finalised in June this year providing 241 affordable, quality affordable rental apartments,” explained Jaco Enslin, Contracts Director for WF KROON Projects. “The developer, Yeast City Housing NPC, has established apartments for rent,” he explained “A further 492 units are set for completion in April 2017 with the development financing supplied by the government departments. Thembelihle Village is a mixed-income residential development which will consist of studio units, as well as one, two and three-bedroom units. It will include an after-care facility, gym, swimming pool, mini soccer field, vegetable garden as well as a job and training centre. Developers have also incorporated cutting edge green technology throughout to ease the economic and environmental burden. Biometric access control, CCTV cameras and 24-hour security will also ensure the safety of all residents. ASA Architectural Design team head, Anca Szalavicz, said that, as with most of their designs for social housing projects, her team sought the most efficient unit design, as every square inch counts. “This applies to the block design as well in trying to minimise the extent of common areas,” said Szalavicz. “With every project we strive to allow for as much green space as possible, detached from cars and street, creating a green haven with playgrounds and meeting places within the core of the city centre”. “As this project occupies most of the city block, particular attention was paid to the treatment of buildings and enhancement of street corners. We also focused on pedestrians, with the creation of covered arcades, for an interactive, safe, public realm. “Thembelihle will really make a positive contribution to its somewhat depressed surroundings and will reflect the special character of the inner city of Tshwane of high-rise and high density mix of uses,” she explained. The 733 units will be clustered around a green lane within a four-storey walk-up, as well as 10 and 11-storey high rise blocks situated along Johannes Ramokhoase Street. There is vehicle and pedestrian access from Struben Street with additional pedestrian access from Sophie De Bruyn Street. Szalavicz explained that Sophie de Bruyn Street has been identified as a major pedestrian thoroughfare and as such several shops and food outlets are proposed along it, further enhancing convenience for the residents and the area’s vibrancy. One constant struggle when developing quality, social housing is keeping the costs down while ensuring residents receive the best possible product which will provide a sense of pride in the home. Scalavicz said this was one of the reasons they selected Corobrik’s Montana Light Travertine range of face bricks, which are both affordable and provide low maintenance. Musa Shangase, Corobrik’s commercial director, reiterated this point, saying their range was the best option for social housing developments in the long run. “Our quality face brick is both affordable and durable, ensuring any building constructed using our materials remains for years to come,” he explained. Shangase also explained the lack of maintenance needed in the form of plastering and painting, both at construction phase and later on, means ongoing cost savings for everyone involved. “The bricks have incredible thermal insulation which means no need for artificial heating and cooling within the buildings, further saving on costs, as well as sound insulation that creates a habitable living environment for all residents in close proximity,” said Shangase. In addition to this, Corobrik provided essential on-site bricklaying training for subcontractors involved in construction. Corobrik offers training courses at its various building training centres, as well as on-site training, to the general public, not for profit but so as to provide skills to previously unskilled members.